Not many people can say they were associated with two different national championship teams in the same year, but Don James can. Don coached the University of Washington Huskies to an undefeated 12-0 season and Rose Bowl win over Michigan, earning national championship honors as voted by the college coaches, while across the United States his alma mater, the University of Miami, also finished 12-0 and earned national championship honors as voted by the sports writers and sportscasters. James played quarterback for the Hurricanes in 1952 and 1953. 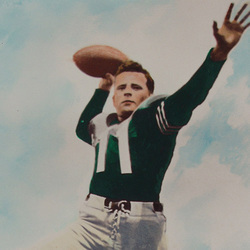 During the 1952 season he established, then UM records, for completions (82), attempts (144) and yards (913), and completion percentage (56.9%) The next year he added his name to the career record book for completions (121) and yardage (1363). He also played defensice back in the single platoon system. Sports wasn't James' only focus, he was presented the Phillip Optner Trophy for the senior with the highest academic average, was tapped into Iron Arrow and was listed in "Who's Who in American Colleges and Universities. James went on to become a coach at Florida State, Michigan, Colorado, Kent State and eventually the head coach at Washington. Don James will always be considered a premier quarterback at "Quarterback U".